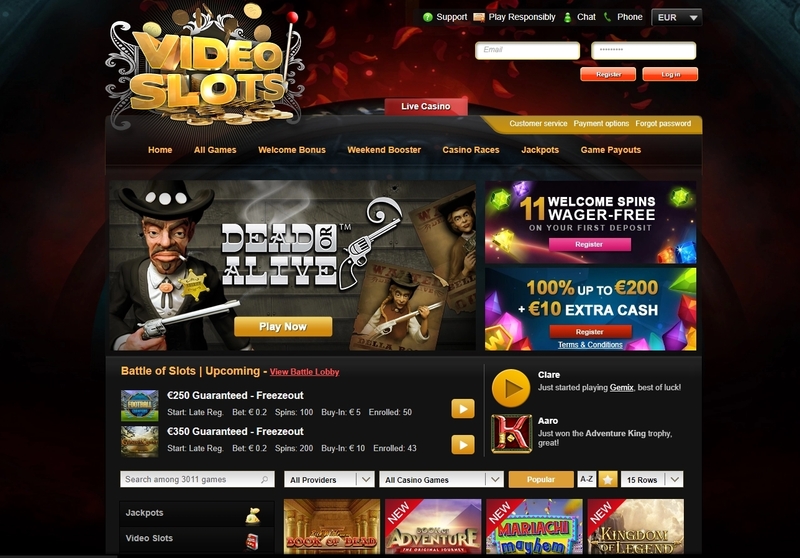 Videoslots is an online casino that was established in 2011 in Netherlands. It has been on the online gambling scene for less than ten years but has still managed to create a niche for itself amongst its more experienced competitors. The company is known for its amazingly creative promotions that you will not find at any other casino. As the name suggests the bulk of their games are online casino slots. They also have a variety of other games which are mainly poker and versions of online poker games. The company is all about customer satisfaction and have a dedicated and professional customer service team on hand for their customers. Exceptional customer service. As much as Videoslots online casino is a very brilliant and customer satisfaction oriented platform there are a few short comings that could be addressed to make it better. The first drawback is that the casino does not have a great video poker platform considering that their founders were expert poker players. They have limited time limits on bonuses. The bonuses and promotions from videoslots online casino are generous, unique and keep on giving. In addition to the cash bonuses, the casino also offers players different extra spin bonuses. All new registrations to the website from the UK, Sweden, Australia, and Finland automatically receive 11 welcome spins after the first deposit to use on the popular NetEnt slot Starburst. New players who register with a deposit of more than €400 will get an additional extra spins bonus of one hundred and fifty spins. For veteran players on the site, there are other numerous extra spin opportunities that they can find in the regular casino newsletter. The diverse menu of extra spins and cash bonuses offered by Videoslots is a true testament to the value that they put on their online casino fan base. The extra spins, if used well by players, could always end up earning them some real cash on their first visit to this online casino. In order for a player to claim their winnings in cash, they must first bet 20 at least. What are you waiting for, register at this online casino today and get your extra spins. Choosing your favorite or the right game is the key to a player’s enjoyment at an online casino. The game choice could be the difference between winning and losing a jackpot. Videoslots has a very large array of online slot and table games that players can choose from. Videoslots casino slots are powered by different gaming software providers such as Microgaming, Play’N Go, NetEnt, Multislot, NextGen, ELK and Genesis among many others. The online slots from these suppliers range from 3D, 243 ways, 5-reels, branded and progressive jackpot slots. These providers have helped videoslots online casino collect an arsenal of more than 1,200 online casino games. Some of the most popular slot games that are featured on the Videoslots platform include South Park, Mega Moolah, and the Dark Knight, King Cashalot, Major Millions and the popular slot among many others. If you are not a slots fan, no need to worry because they have other games at Videoslots live casino such as table games and poker. The varieties of video poker games include extravagant titles such as bonus deuces wild and double joker. They also have classics like All American poker and tens or better. The table games include more than 20 variants of blackjack such as Super Fun 21 and Atlantic City Blackjack. Videoslots online casino only uses the very best gaming software suppliers in order to maintain quality and enhance variety for their players. One of their major suppliers who is the creators of games such as Tower Quest and Gemix. This game provider is known for having brightly colored online casino games that offer rewarding features and bonus games. If you are a fan of extra spins you will definitely love their games. The Videoslots casino is among the most highly rated online slots casinos. The casino has a very easy to navigate platform, there is a search and filter function to help players find their favorite games. These features can be enjoyed on most popular gaming devices. When Using Videoslots on Android you will not have to download and install any software on your device simply play using your web browser. Some of the games that can be enjoyed at Videoslots on iPhone & iPad include Microgaming Quickfire products such as The Mega Moolah jackpot series, Immortal romance, The Dark Knight. And The reels of life. Most of the games on this mobile online casino can be played for free on demo mode. As much as the Videoslots online mobile casino may seem adequate there have been some major criticisms about it. The major criticism has to do with the choice to make the mobile casino web browser based instead of App based. This would have been a better option because of their large game selection. Videoslots is an online platform that possesses all these qualities and then some. This is why it is one of the most visited and trusted online casinos. You don’t have to take my word for it, visit it today and experience it for yourself.